Visit all the gorgeous beaches from Boca Grande all the way up to Manasota Key, FL. There are many gorgeous, unspoiled beaches located along the island including "Stump Pass" and "Gasparilla Pass" just to name a few! Tour through the lush mangroves to Don Pedro State Park or over to Little Gasparilla Island, both of which are only accessible by boat! Several of these islands such as Palm, Knight, Don Pedro and Little Gasparilla can all be grouped together because they are all now the same barrier island just off the coast of Cape Haze, Florida. These islands were once separated but the two passes have since filled to make one complete tropical island paradise! Accessible only by boat, Cayo Costa State Park offers a remote 9-mile stretch of beach where one can find an array of dazzling seashells by day and see cereus cactus flowers bloom gloriously by night. Visitors can enjoy swimming, snorkeling, and hunting for seashells. Sometimes manatees or pods of dolphins can been seen in the sparkling waters. There are 6.5 miles of hiking and biking trails to explore as well. The fishing is fine enough for novice and experienced anglers alike. Be sure to obtain a Florida Fishing license if you plan to cast a line. The 2,426-acre state park is home to over 175 species of birds, lush pine forests, oak-palm hammocks and mangrove swamps. An amphitheater provides educational programs about the island's ecology and history. Let Gulf Island Tours take you to Cayo Costa, recently named America's # 2 secluded beach by US News, and Travel & Leisure Magazine rated as #7 of Americas Best Undiscovered Islands. Be sure to pack your beach bag and bring along anything you would like to eat or drink, as there are no facilities at Cayo Costa State Park. Stepping onto Cabbage Key is like stepping back into time, back into the rustic, natural Florida that existed before commercial development. The charm of that era is alive here. No beaches. No swimming or shelling. No traffic. Just peace, quiet and off-the-beaten-path tranquility on 100 untouched acres in the waters of the Pine Island Sound. 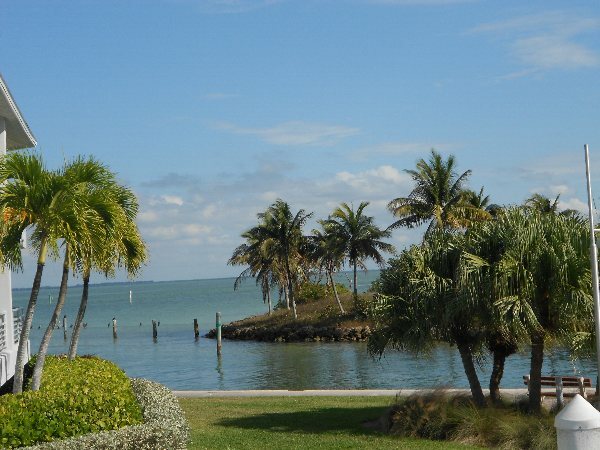 There are nature trails to explore, and the historic Cabbage Key Inn & Restaurant, which was built atop a 38-foot pre-Columbian Indian mound. The structure was built in 1938 by playwright and novelist Mary Roberts Rinehart. The Inn’s famous and decades-old watering hole is plastered with dollar bills covering the walls and ceilings. Celebrities including Ernest Hemingway, Florida mystery writer John D. McDonald, Katharine Hepburn, Ted Koppel and Julia Roberts have all visited the secluded island. 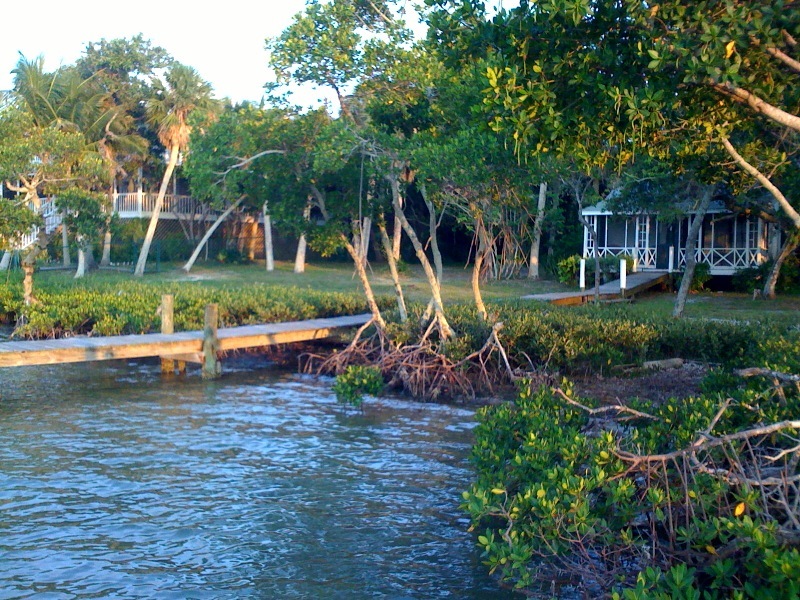 Cabbage Key is said to be the inspiration for Jimmy Buffett’s “Cheeseburger in Paradise” anthem claimed to have been written on one of the singer’s many meals on the island. It’s as near a deserted island experience as most people will ever have. 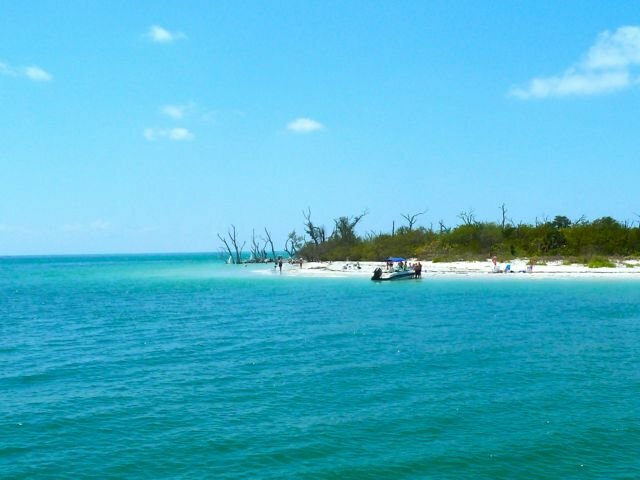 So take the time to escape the world on Cabbage Key with Gulf Island Tours! 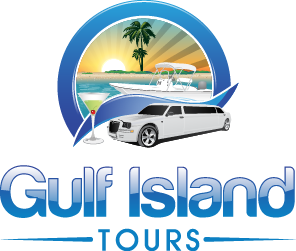 Gulf Island Tours gets the party started with our Deck Boat Tour! We’re your limousine on the water for dock-hopping at many of the numerous public docks in southwest Florida’s entertaining coastal towns. 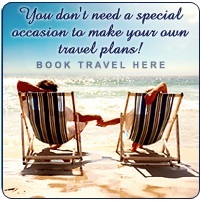 Get a group together and cruise to one of the area’s popular restaurants like Englewood's White Elephant Pub & Tiki Bar, The Lock 'n' Key Pub, The Sandbar Tiki plus many more …most with live entertainment and all offering the laid back hospitality and warmth of sunny Florida. 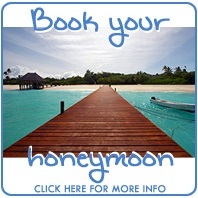 Book our deck boat in advance (just like a land limo!) as soon as you get your group together and enjoy on your next night out on the water in Southwest Florida! This tour is also great for the night fishing enthusiast.